Happy Monday everyone! I hope you’ve recovered from the weekends gorging festivities. As mentioned here, we spent Thanksgiving with Evan’s brother in Brookline, New Hampshire, a very small border town just outside of Massachusetts. We hadn’t seen our niece and nephews since the summer so it was a much needed family reunion. 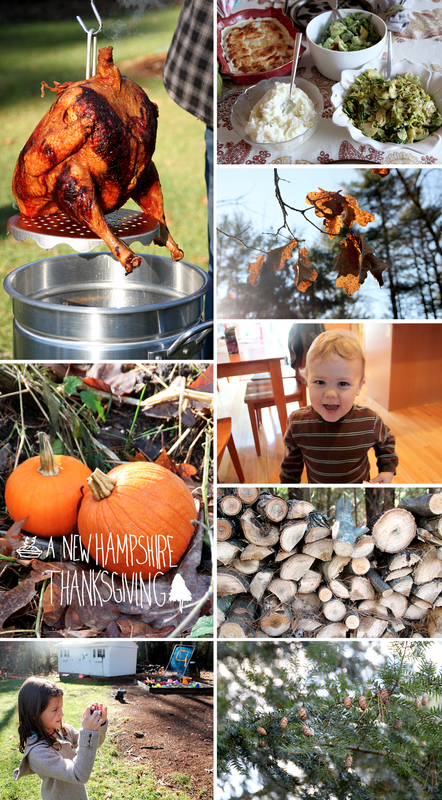 Above are some pictures from our weekend in woodsy Brookline. So, remember how I said that we were off to Virginia for a month before leaving for LA? And how abruptly our New York stay came to an end? ….and how sad I was about it? Well, we were thrown another curve ball. Evan’s been working at a motion house near Soho and they asked him (last-minute) to stay a little longer for a project that’s due at the end of December. So….. here I sit, in a quaint furnished studio in NYC! I’m all mixed feelings about it. I mean, I wanted to stay once I knew we had to leave but when it was decided that we were on our way to VA for a month of country living, I was pretty excited about the change of pace. Not to mention that Evan and I have been wanting a little free time to work on a few self-initiated projects that have been dancing in our heads for a while. But, c’est la vie, I guess. I have one more month in this great city and other than location, not a whole lot changes for me in my daily life so I’ll just learn to cope. It’s kind of funny, but over the weekend, we went to our niece (age 8) and nephew’s (age 6) karate class and they were learning about adaptation being the most resourceful of survival skills… guess we all learned something that day. xoxo! P.S. Fried turkey is the way to go! Best I’ve ever had. Carmel, I don’t think I’d be brave enough to attempt fried turkey myself but my brother-in-law is a BBQ/outdoor cooking master so the job of frying the bird went to him. It seemed easier and faster than any other turkey in the history of my Thanksgiving’s. It only took 45 minutes to cook and NO brining! Hope you had a great Thanksgiving!